Egg Nutrition - Health Benefit or Hazard? When it comes to egg nutrition, not only does this sulfur rich food give a long list of health benefits, but also has two ingredients that seem to discourage many folks from eating it. The most common variety of eggs eaten on the planet are chicken eggs. Though many other types can be eaten such as duck, pheasant, goose and quail just to name a few. 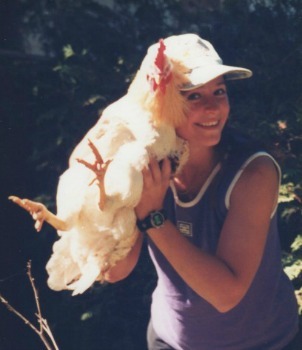 For about 5 years we decided to raise a few chickens. Not only did they provide the family with lots of joy (they make pretty cool pets) but they also provided us with fresh eggs daily. Here are my little ones enjoying the sunshine in the backyard. They really do make wonderful pets. If you get them when they are small chics they are very calm and friendly. It's a great learning adventure for the kids and the whole family can help take care of them. It's fun collecting the eggs in the morning. Eggs are sulfur rich and contain good amounts of protein, choline, calcium, phosphorus, potassium, vitamin A and vitamin D. They also contain many other nutrients in smaller amounts. Sulfur - Our bodies need sulfur to maintain proper functioning of our cardiovascular system, muscles and central nervous system. They aid in the absorption of calcium and also help repair and rebuild bone, cartilage and connective tissue. They protect us against the effects of radiation and pollution. Choline - helps regulate the nervous system and helps maintain a healthy memory and brain function. Protein - Eggs are high in protein and because of this fact the United States Department of Agriculture places the eggs in the meat category. Eggs also supply all the essential amino acids, which provide the body with a complete protein. Proteins are essential for all humans as they provide the building blocks of all tissue and cells. Retinol (vitamin A) - In a nutshell, Vitamin A is essential for healthy skin, hair, eyes, bones and teeth. This vitamin also enhances the body’s immunity and helps prevent the common cold, flu and infections. Calcium - which maintains healthy bones and helps prevent osteoporosis. Phosphorous - works with calcium to maintain strong, healthy bones and teeth. Also provides you with energy throughout the day and helps the body absorb needed vitamin B. 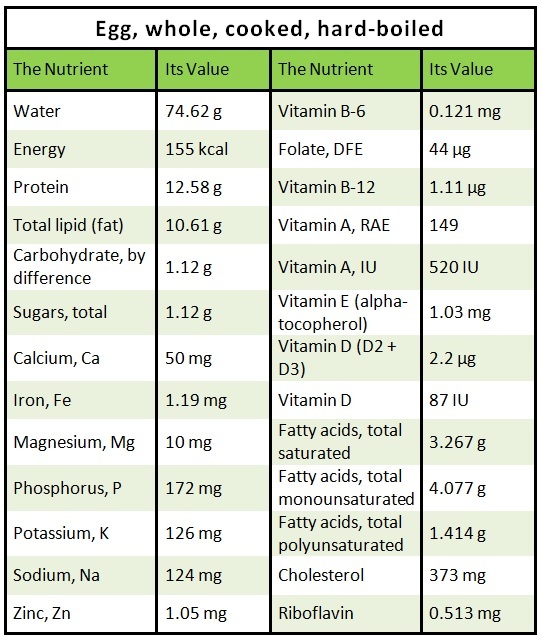 According to the USDA National Nutrient Database for Standard Reference here is the nutrients for a hard boiled egg. The yolk contains about 60 calories, whereas the egg white contains about 15 calories and also provide choline and vitamins A, D, E and K.
The egg yolks contain all of the egg's cholesterol and fat and about one half of the egg's protein. Does Egg Nutrition Pose any Health Risks? Two words come to mind that may prevent people from enjoying eggs to the fullest and those words are cholesterol and fat. Though some studies show that the human body doesn't really absorb much of the cholesterol from eggs a large yolk contains more than two-thirds of the recommended daily intake of cholesterol. The yolk also contains all the fat. More than half of the calories in an egg come from the fat in the yolk. Some research shows that egg yolks present a health risk while other research shows that one egg a day does not appear to impose any risks at all? I also came across this July 2006 report by the Harvard Medical School that offers more information on this subject. It's a good read if you have the time. Egg Nutrition and Heart Disease: Eggs aren't the dietary demons they're cracked up to be. Unless you're dealing with a cholesterol problem, eating eggs in moderation seems to be a healthy and wise choice. 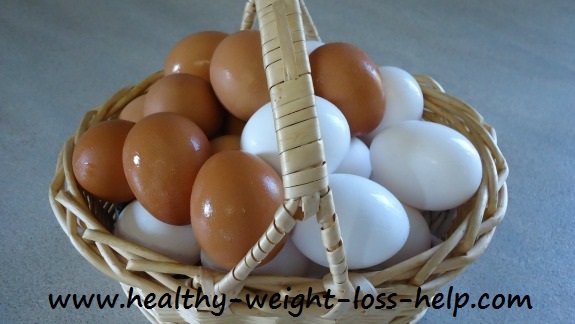 Eggs are fantastic for weight loss as they offer lots of protein and nutrition. They are filling yet low in calories. So get creative and get cracking.